Thick Sludge: Slows enemies by 10% for 2 seconds every 0.5 seconds, sacking up to 3 times. Toxic Ooze: Deals 35 damage every 0.5 seconds. Putrid Mixture: Reduces the damage of enemy Heroes by 5% for 1.5 seconds every 0.5 seconds, stacking up to 4 times. Throw a flask of vile liquid that explodes at the target location, dealing 165 damage in the area. The concoction spreads over 2.5 seconds, with effects depending on its type, chosen with Mad Alchemist. Stores up to 3 charges. Vile Concoction's cooldown replenishes all charges at the same time. Create a Flesh Monstrosity with 850 Health that attacks the target, dealing 50 damage per second. Up to 2 Flesh Monstrosities can be active at once. Vile Concoctions affect the Flesh Monstrosity with the opposite effect. Activate when on cooldown to retarget all active Flesh Monstrosities. Launch a blob of slime that jumps 3 times in the target direction, dealing 120 damage to enemies and healing Putricide and Flesh Monstrosities for 100. After 1 second, create a pool of deadly blight for 5 seconds that deals 80 damage per second. The pool spreads along Heroes' or Flesh Monstrosities' path for 3 seconds after they leave the area, staying on the ground for 5 seconds. “Accidentally” consume all remaining charges of Vile Concoction when its cooldown ends. Each charge increases Spell Power by 5% and Armor by 5 for 10 seconds, stacking up to 3 times. Transform into a monstrosity at 3 stacks, causing Basic Attacks to become melee but deal 100% more damage. Activate to toggle on or off. Mad Alchemist generates Vile Concoctions 50% faster when at 2 or more charges. Flesh Monstrosity gains 25 Armor for 4 seconds when it passes through a Vile Concoction. !Quest: Hit enemy Heroes with Living Slime. !Reward: After hitting 30 Heroes, increase Living Slime's radius by 15%. !Reward: After hitting 60 Heroes, increase Living Slime's heal amount by 30% and radius by an additional 20%. Enemies take 30% increased damage from Putricide's Basic Attacks while affected by Vile Concoction. Flesh Monstrosity deals 30% more damage to Heroes, but its Health is reduced by 10%. Living Slime Roots enemies for 1 second if it hits them a 2nd time. Thick Sludge lasts an additional 1.5 seconds after fully spreading. Toxic Ooze lasts an additional 1 second on enemies who leave the area. Heroes inside Putrid Mixture's area have their Armor reduced by 10. Flesh Monstrosity has 40% increased Attack Speed while affected by Vile Concoction. Vile Concoction’s spread duration and maximum size are increased by 40% for each enemy Hero hit by the explosion, up to 120%. Standing in Vile Concoction increases Putricide's Attack Speed by 40%. Flesh Monstrosity reduces Living Slime's cooldown by 0.5 seconds when it deals damage. 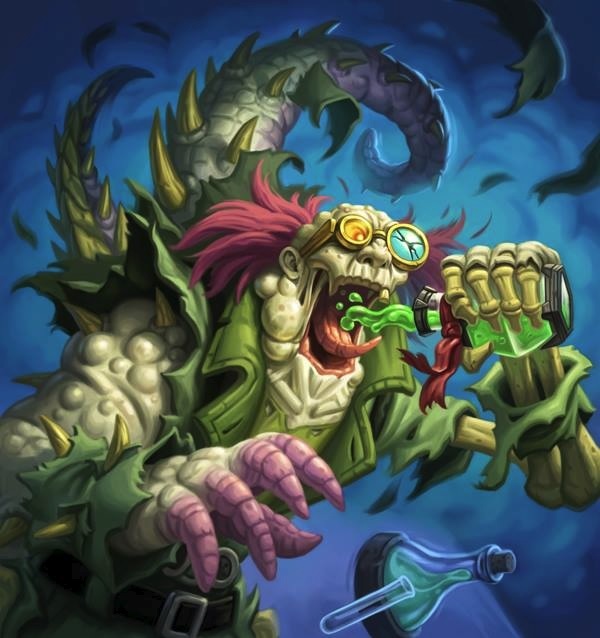 Activate to cause Putricide’s Basic Attacks to apply the full effects of his current Vile Concoction type to Heroes for 3 seconds, independently of other Vile Concoction effects. Lasts 10 seconds. Newer Vile Concoctions extend the duration of older ones if they overlap, for a maximum of 8 active Vile Concoctions. Flesh Monstrosity explodes on death, dealing 250 damage to nearby enemies and launching a Living Slime in the direction it was facing. Guzzle Potions no longer consumes Vile Concoction charges and always grants at least 1 stack. Putricide is affected by Vile Concoction's opposite effect. Deathpool Slows enemies by 35% and its cooldown recharges 100% faster while Vile Concoction is active. Flesh Monstrosities’ attacks refund 5 Mana and reduce the Ability's cooldown by 1 second, and up to 3 can be active at once. Living Slime gains a 2nd charge and jumps an additional time whenever it lands on an active Vile Concoction.